For the first time since we started our trip, we are now in a country that neither one of us has visited. It marks the start of a long period of time in South-east Asia, and also discovering a different culture. We have been in Thailand for 15 days now, and we are having a blast ! Bangkok is an exuberant and wild megalopolis, with both its good and bad sides. We spent 4 days trying to explore the city and trying to understand why it is such a tourist success, but we are still unsure whether we like it or not. From the point of view of visits, our favourite temple was Wat Pho. It is mostly associated with the iconic large golden reclining Buddha, but the rest of the temple is beautiful and much more relaxing to see. Indeed, most visitors stick to the reclining Buddha in a desperate attempt to grab a good selfie with it. The next day, in order to breathe a bit and get out of the chaos downtown, we took the express boat on the Chao Phraya to the final stop north of the city (following Phiphi’s advice). After walking randomly around for a bit, we found a very nice local market (we were the only tourists there) where there were tons of fruits and lots of fish attempting (and sometimes succeeding) to get out of their buckets of water. There, we tried jackfruits for the first time (which are really good!) and fresh coconut. It was the first time, but it certainly won’t be the last ! On the week-end, we spent a whole morning in the famous Chatuchak market, which is comprised of nearly 8000 stalls. We found it a bit disappointing : it was probably a very interesting place 20 or 30 years ago, but today it looks a bit like a tourist trap. It’s still fun, but definitely not authentic. Finally, we have to talk about the neighbourhood in which we were staying, Sukhumvit. By day, we are mostly struck by the many gigantic malls full of rather luxurious brands. One of them even had themes for each floor, a bit like in Las Vegas casinos (!). By night, we quickly realized that sexual tourism was heavily present around the area. We were shocked and disgusted by the amount of paunchy white men holding hands with young (sometimes very young) Thai girls. To break a bit with the usual path most travellers choose when visiting Thailand, we took the train to Pak Chong and rented a 125cc motorbike for 3 days. We went straight to Khao Yai National Park, where we planted our tent. The park (the 1st one to get the National Park qualification in Thailand) is known for its double waterfall heavily featured in Danny Boyle’s “The Beach”. On the menu, waterfalls, hikes in the jungle, and a lot of wildlife watching : we saw a crocodile, a male elephant alone, a herd of female elephants with 3 cubs, macaques and gibbons a bit everywhere, hornbills, deer, a gigantic spider, weird caterpillars and a lot of colourful butterflies. Our 3 days over there were really amazing and are really a highlight of our travels. We had read in our guidebook that all of Bangkok came to Khao Yai on the week-ends to get a bit of fresh air. This was not an exaggeration ! On Saturday evening, the campground which didn’t seem to have the concept of being full really looked like the sleeping area of a big festival. Every square inch of free space was covered by a tent, and there were so many cars that we had trouble finding a spot to park our motorbike when getting back from the day in the park. Not counting the resulting state of the toilets and showers, this was pretty fun ! Usually a 2-hour stop for travellers on their way to Chiang Mai, we decided to stop for 2 days in the town of Lopburi, which is commonly known as the “monkey city”. It’s actually quite impressive as there are monkeys absolutely everywhere, and they are quite aggressive when it comes to looking for food (Tracy got harassed by two monkeys who wouldn’t stop climbing her trousers and shaking them). The city in itself doesn’t have much to offer apart from a few temples in ruins here and there, but the countryside around it is certainly beautiful. The next day, we rented a motorbike again to be able to go around. We ended up alone, riding on dirt roads, surrounded by sunflower fields and mountains. Amazing ! We walked around a bit, and went back on the motorbike for an hour to get to Wat Khao Wongkot, an active temple built on the side of a small mountain, accessible through small roads in the middle of the rice fields. At the heart of this temple is a wide and steep staircase that goes up the mountain side, surrounded by little “chedis” and arriving at a small cave opening. 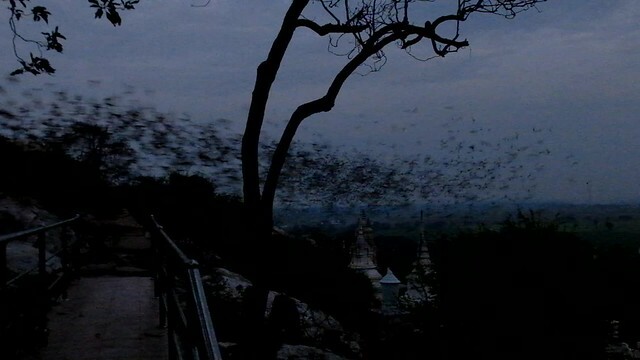 When the sun sets and just before nightfall, millions of bats emerge from that hole in a dense and continuous flow that lasts for 2 hours, We were the only ones standing there, a few meters from the cave entrance, and we remained speechless in front of such an incredible thing. The capital of the Siam kingdom before Ayutthaya was Sukhothai. And just like Ayutthaya, it is now a UNESCO World Heritage site. The sunset on the ruins of Wat Mahathat looks particularly beautiful. During our visit, some sort of celebrations were going on inside the historical park to commemorate the 100th day since the death of the king (the commemorations will last a year). While in the bus to get to Sukhothai we met 2 other french couples with whom we spent the evening and a full day visiting. They in turn introduced us to another couple and we all spent a night together. Thanks to Marie and Steph, Andrea and Arthur as well as Karine and Pierre for the good moments we spent together ! After an 8-hour bus ride to do roughly 400km, we arrived in Chiang Rai, capital of the province of the same name, in the north of Thailand. A very modern and friendly city, we found a lovely little guesthouse (Chat Guesthouse) where we can stay for cheap in a very relaxing atmosphere. After randomly walking in town in the evening, we ended up finding the town’s flower festival, showing some very beautiful flowerbeds and enchanting lights, music concerts, and a night market full of food and hand-crafted products. Today, we enjoyed the calm atmosphere and took the opportunity to rest a bit and write this blog post. Tomorrow, we leave for Chiang Saen, along the Mekong. Great post guys! Hope you’re enjoying Asia! We are having a great time here. We’re a bit late for posting on the blog (internet in Myanmar isn’t so great) but we’re trying to catch up!